It’s a silly thought, I know. 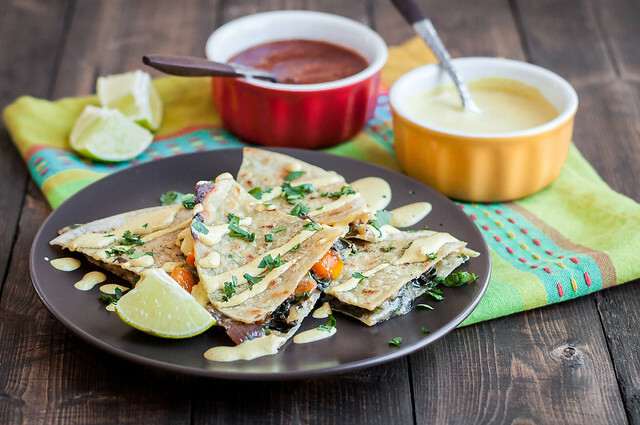 How can one ever tire of a good ol’ veggie quesadilla? Greens, peppers, onion, mushrooms, and whatever other vegetables you want to load it up with, all smothered with cheese and lightly fried between two baby corn tortillas. Serve them with a side of salsa, sour cream, or guac, and you have a complete meal, no matter what time of day it is. My personal preference is to enjoy quesadillas around 11:30 PM, usually after a margarita or two, so I can go to bed on a tummy full of delectable cheese. Kind of kidding, but sometimes you have to indulge and make bad food decisions. Despite the exalted status of the veggie quesadilla, though, I was recently inspired by an unlikely source to take my ‘dillas to the next level. 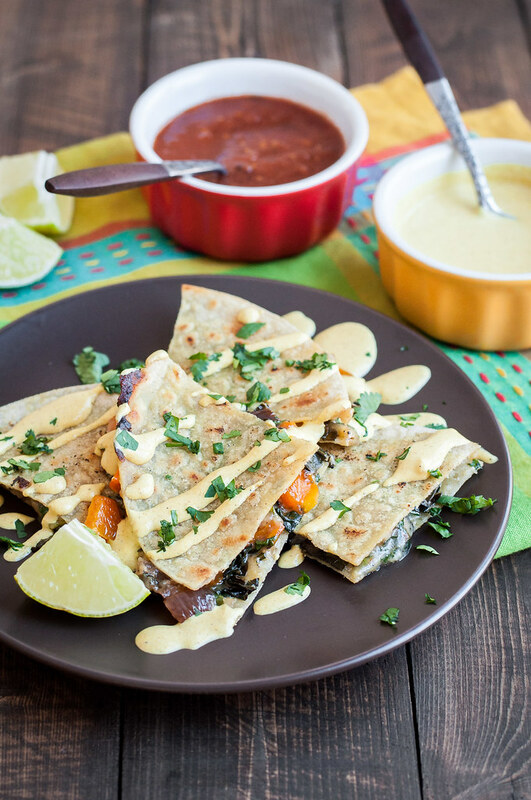 The Indian-Mex (new thing) level of curry kale quesadillas. The culprit, of all things, is Beat Bobby Flay. First of all, say Bobby Flay ten times fast and try not to end up in a fit of laughter. When you recover, ridicule me for watching questionable television, and then go make these curry quesadillas. You might change your tune. Because, as I learned from Bobby’s likely defeated (I didn’t watch the end) competitor, Indian flavors in a quesadilla are not only a contradiction, but a simple way to highlight all the good things about often overused bell peppers. You know them well: those Costco or Sam’s Club 6-packs of multi-colored bell peppers that really are too good of a deal to pass up until you get home to your family of two and realize that you can only eat so much hummus and so many omelets. That was my attitude exactly until the stars aligned and I was so desperate for a puppy break that I would watch anything on Food Network, even terrible live cooking battles in which the stands are filled with tourists who were probably paid to be there cheering. Because who goes to New York for a filming of Beat Bobby Flay? If it’s you please don’t speak up. 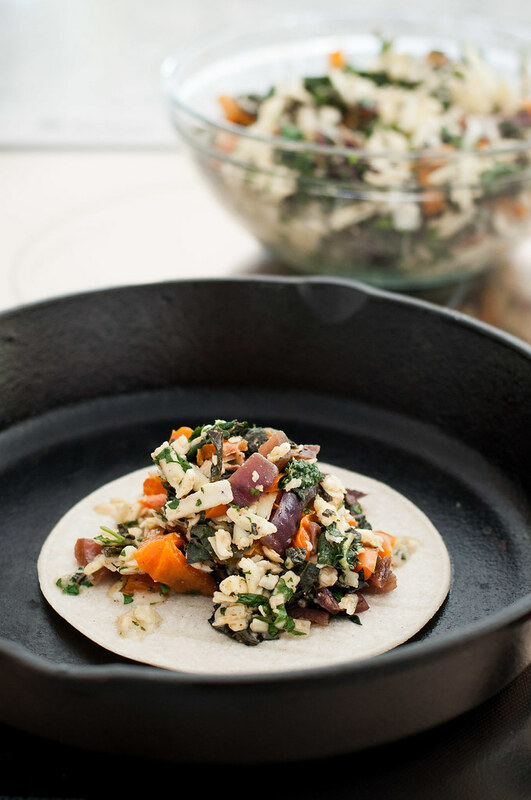 There’s nothing revolutionary about preparing these curry kale quesadillas except the end product that you put in your mouth. If you’ve made a quesadilla before, or even if you haven’t, you can throw these together just as quickly as the next no-recipe quesadilla. The sharp and creamy combination of manchego and havarti cheese builds on the exotic, cozy flavors in the recipe, but don’t feel the need to make an extra trip to the store for these varieties when you have a pound of cheddar, monterey jack, or even pepper jack cheese already in the fridge. 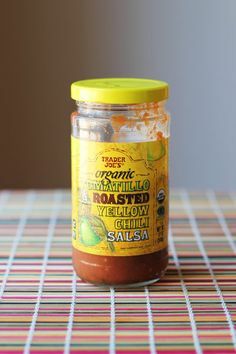 A smoky salsa, like this one from Trader Joe’s, contrasts nicely with bright, complex curry, but if you can spare a few moments the day before, I highly encourage upgrading your sour cream to the included Indian spiced sour cream sauce. Besides using up one more of those prolific peppers, garlic and ginger and spices infuse the sour cream as it refrigerates and you’re rewarded with a sauce that tastes like something you might just find in an adventurous Indian restaurant. Bragging rights for you. On another note, if you’ve been reading a while, you might have noticed that I just went record time–like maybe an actual record–without a blog post. And no, I haven’t just been chasing around our recently reformed snuggly puglet. Two years of blogging have flown by, and now it’s a part of my life, a creative outlet, that I could never give up. But when I think about the future of NCK or look around at all the other inspiring foodie websites and even cookbooks, I feel like I could be doing more for you guys, my readers. I work so hard at this endeavor, and it’s most certainly not for any money I might be making from it, but I haven’t checked off any of those big goals, like creating another free eBook or working to expand our community of healthy home cooks and comfort food lovers. So, in what seems on the internet like a quiet lull, I’ve actually been really working on a plan for this year to get to those things I just mentioned and more. It’s time to take some risks and see what this community can become if I don’t limit it to just frantically posting three times a week and answering blog comments. In practical steps, I’ve released a quick survey that I’d love for you to take. It’s for subscribers, so before you take it, just sign up here to get the free eCookbook that the survey references. Then take approximately 1.73 minutes to fill out a few multiple choice questions. None of that fill-in-the-blank/comment field nonsense (of course I’d still love your detailed feedback–just contact me here if you have more to say!). And please, let me know about your new year’s endeavors. 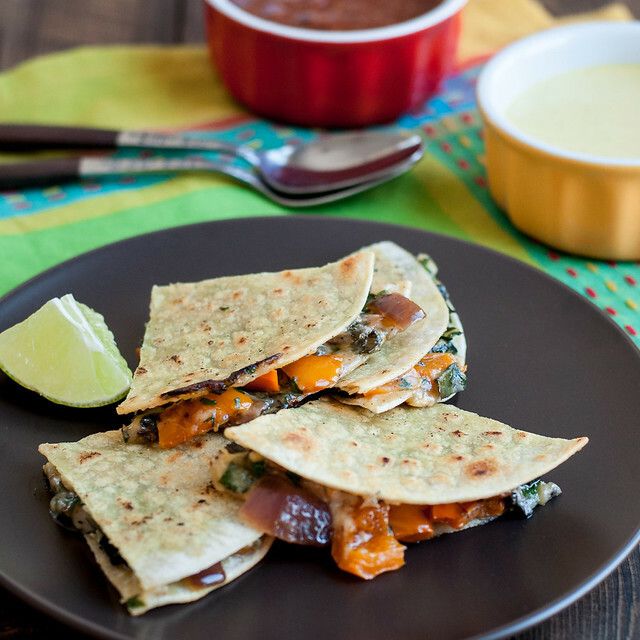 You can leave a comment below, and it doesn’t just have to be about curry kale quesadillas. If you’re going after big things in 2016, it’d be fun to get a little support going here. If nothing else, I’ll help you out with quick, healthy dinners so you can focus on making things happen. Meatless and gluten-free. 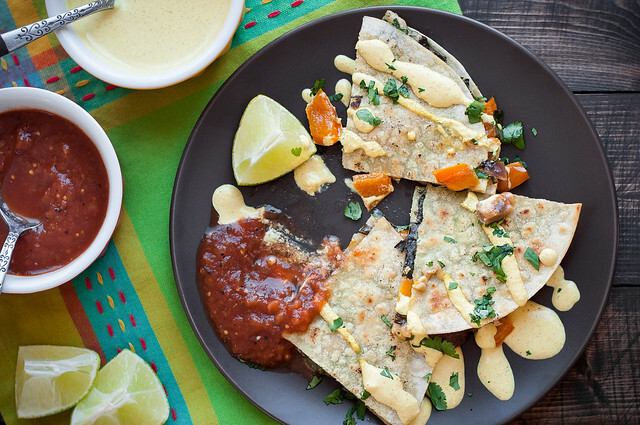 For extra quick assembly (or quesadillas all week), sauté the vegetables or mix the filling for these Indian-Mex quesadillas ahead of time. Havarti is a very soft cheese, perfect for quesadillas, but it softens quickly, so refrigerate it until ready to use. The sweet pepper sour cream is optional, highly encouraged, and does best made ahead so it has plenty of time to chill. 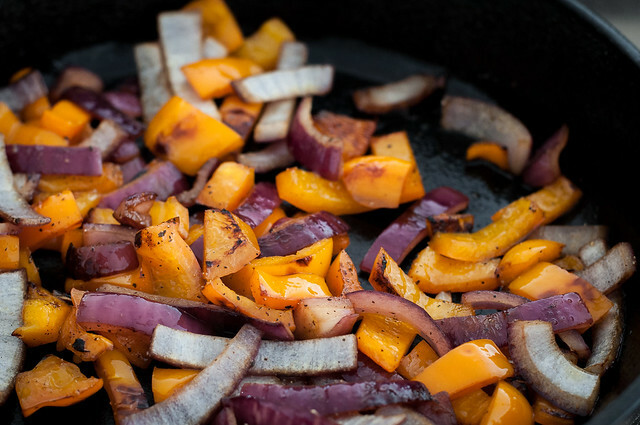 Lightly rub the outside of the pepper with vegetable oil and broil about 6 inches from the heat for 5 to 8 minutes per side. Once blistered and blackened almost all over, place in a heatproof bowl and cover with plastic wrap, a dish towel, and a plate or pan for 15 minutes. Uncover and peel off skin by hand, then stem and seed. Dry on paper towels, roughly chop, and place in a blender or food processor once cooled. Add ¼ cup of the sour cream and remaining sauce ingredients and blend until smooth. Stir in ½ teaspoon salt and remaining ½ cup sour cream by hand. Refrigerate until chilled, a day or more if time permits. Heat a tablespoon of coconut oil over medium high in a 10" or larger cast iron skillet. Add peppers and onion and cook until well browned in places and mostly softened, stirring infrequently. Season with salt and pepper and transfer to a mixing bowl to cool. In the same skillet, heat remaining coconut oil over medium, sprinkle curry powder into the pan, and cook for a minute, stirring. Add kale, a generous pinch of salt, and the lime juice. Stir occasionally until kale is completely wilted, 5 minutes or more. Remove to a cutting board, chop small, and add to the bowl of peppers and onions. When the vegetables are cool enough that they won't melt the cheese (refrigerate to speed this up), add both cheeses, cilantro, and salt and pepper to taste. Carefully wipe out the cast iron skillet with a damp cloth. While it heats over medium high, brush one side of each tortilla with vegetable oil. Lay one tortilla oil side down in the skillet, top with about ¾ cup filling (I used three of the scooper linked above), and spread filling about ½ inch short of the edge. Top with a second tortilla, oil side out. Press down on the quesadilla for 10 to 20 seconds with a big spatula, then continue to fry for a few minutes until lightly browned and the cheese is melting well. Use the spatula to flip the quesadilla over and cook until browned on the other side. Scoop any loose filling out of the pan so it doesn't burn. Repeat to make remaining quesadillas. 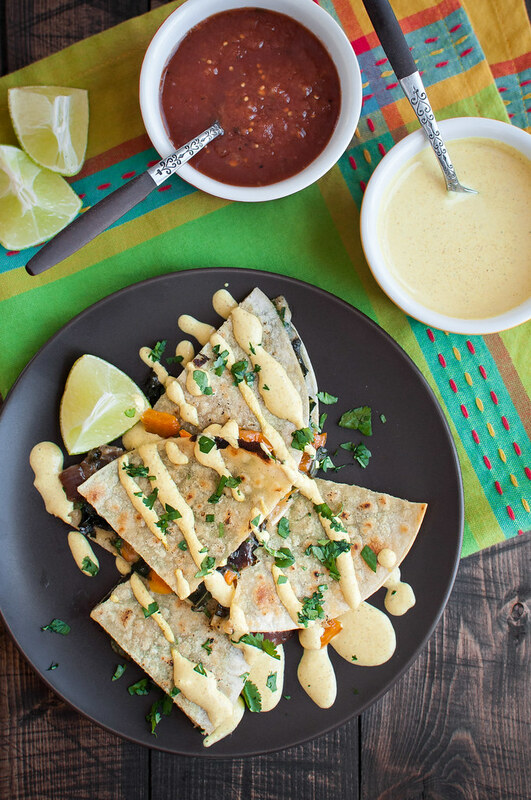 After quesadillas have cooled slightly, cut into fourths and serve with salsa, lime wedges, and the sauce. Make ahead options: these are a great make ahead dinner. Things you can do ahead: roast the yellow pepper, make the sauce, and prepare the filling. Prep/cook time doesn't include making the sauce or waiting for vegetables to cool. Placing them in the refrigerator will make it quick. Cook time is for making four quesadillas, one at a time. Keep quesadillas warm on a sheet pan in a low oven (250 F) while you make the others, if you're feeding 4 or more. You can easily make more than one at a time on a griddle pan. You can use any kind of kale--I've tried both green curly and lacinato, both with success. Note: This page contains Amazon affiliate links to products on Amazon that will make cooking this recipe oh-so-enjoyable. There’s no extra cost to you for using the links to shop for these products and all your other Amazon needs, and you support NCK in the process. Thank you! Thanks. I found this by accident while coming up with the idea myself (a place in town makes a “Very Veggie Curry Crepe” with Black Beans, Sriracha/Curry Sauce, Black Beans, Onions, Feta Cheese, etc. on a Crepe. But I like Corn Tortillas, and will make my own recipe, taking cues from this recipe, use Monteray Pepper Jack, etc.